With the end of the cold war the tasks of the German armed forces changed: No more large scale conventional warfare in central Europe with huge tank and mechanized infantry forces but small scale peacekeeping and police force missions in places far away from Germany. Peacekeeping missions like in Somalia, Bosnia or Kosovo required new types of vehicles – more suited for the 'asymmetrical' threads (mines, snipers), easy to maintain, cost efficient and air-transportable - something to fill the gap between the 'Wolf' (Mercedes G-class) unarmored light truck and the Tpz1 'Fuchs' APC. So the Krauss-Maffei-Wegman company came up with a newly designed vehicle based on the Unimog 4x4 light truck which is already in service with the German armed forces. A special V-shaped deflector protects the underside of the vehicle from mine blasts (up to 4 kg TNT) and the armored crew cabin construction protects from small arms fire (up to armor-piercing 7.62x51 mm rounds). For better protection the engine and cargo compartments are decoupled from the crew cabin. Seating is provided for five fully equipped crew members: driver, commander, gunner and two additional infantrymen. The vehicle is equipped with an external weapon station on the roof hatch which can carry a 7.62 mm MG3 machine gun, a 0.50 caliber machine gun or a 53 mm MW40 automatic grenade launcher. Only the MG3 version is used so far. The weapon can be fully operated from inside of the vehicle without opening the hatch (except for reloading). Special wheel rims allow the vehicles to be driven with blast tires for about 50 km. For fast deployment around the world the vehicle can be airlifted. Two vehicles fit into a C-160 ‘Transall’. 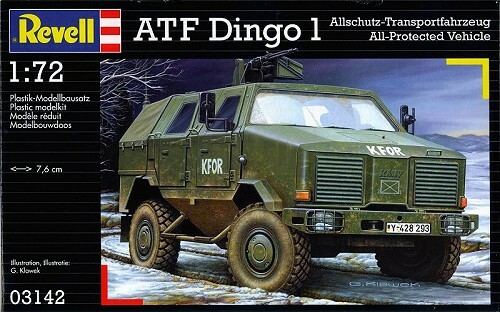 Under the designation ATF-2 ‘Dingo’ (ATF stands for ‘Allschutz-Transportfahzeug’ – fully protected transport vehicle) it entered service with the German armored forces in November 2000. The Bundeswehr acquired about 140 Dingo 1. Meanwhile a more modern version the ATF-3 'Dingo 2' is in production based on a sturdier Unimog chassis and offering more load capacity, automatic transmission and some more modifications. The new version can be distinguished by the modified radiator grille and the new side skirts. Austria (60) and Belgium (220) are the first export customers for this version. Revell's kit is exactly what you would expect from a contemporary Revell scale armor kit. Four sprues (three in dark green and one in clear styrene together in one bag), a multi-language, newspaper-grade paper type instruction sheet and a small decal sheet are packaged in a side-opening cardboard box. The 65 parts are molded crisply and flash free with fine details. A basic interior consisting of five seats, dashboard and steering wheel is provided. The only weak points in this kit are the two-piece wheels - the tires have almost no profile. The clear sprue contains only the window panels – headlight lenses would have been a nice touch here. Building options are limited to different roof hatch armament – a 7.62 mm MG3 machine gun, a 0.50 caliber machine gun or a 53 mm MW40 automatic grenade launcher can be mounted – and open/closed canvas cover for the cargo compartment. No real choice here, since the Bundeswehr only bought the MG3 weapon kit and vehicles with open cargo compartment are rarely seen. Markings are provided for three vehicles in German service: an ISAF vehicle from Kunduz/Afghanistan in three color camo, an overall green KFOR vehicle from Tuzla/Kosovo and another dark green one from an exercise in Macedonia. 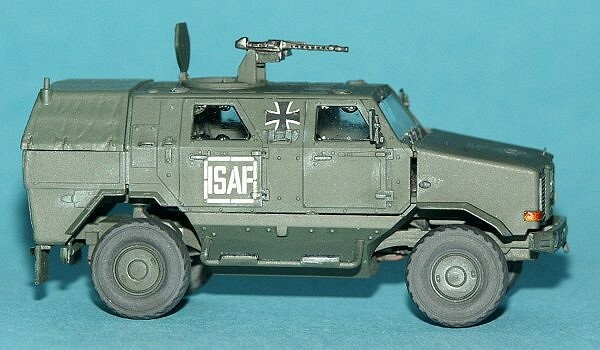 The decals in my kit were slightly out of register, so the German crosses (only needed for the ISAF vehicle) should be replaced with markings from another source. Since this was to be a 'quick build', I wanted to minimize the painting work. After careful study of the instruction sheet I decided not to follow the proposed construction sequence and to build the kit in subassemblies – quite similar to the way the real vehicle is constructed. 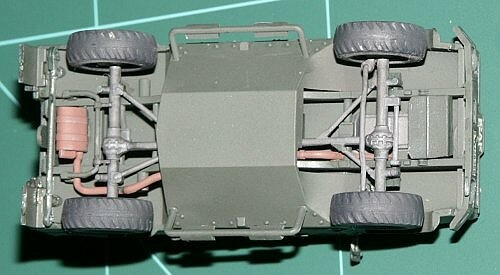 I started with the frame/chassis assembly, which was completed with transmission and suspension parts and the exhaust pipe. Since the instruction is somewhat vague about the exact placement of the exhaust system, some trying and test fitting was necessary. There is some vertical 'misalignment' between the transmission shafts and wheel axle stubs which turned out to be a feature of the real Unimog vehicle – a measure to gain some more ground clearance. The next subassembly is the floor/engine compartment. With some careful alignment this is easily completed. The seams on the hood need some sanding – all gaps should be filled and sanded here, since the engine hood is a one piece affair (similar to the hood of a Hummvee) on the real vehicle. The handhold grip on the hood was replaced with a more delicate version made of fine wire. The crew/cargo compartment is constructed from some almost flat parts so careful alignment of the sidewalls, roof, rear wall and tailgate is essential. When working carefully (i.e. with sparse amount of glue on 'strategic' spots, the floor/engine compartment assembly can be used as alignment template and then removed when the glue has hardened sufficiently. Doing this, a wide gap between engine and crew compartments becomes visible but actually this is exactly what should be there. On the real vehicle the gap is at least 5 centimeter (2 inches) wide. Minor filling and sanding was necessary on some gaps between side and rear walls and roof. The last sub-assembly to complete is the deflector shield which only needs the addition of the footsteps. 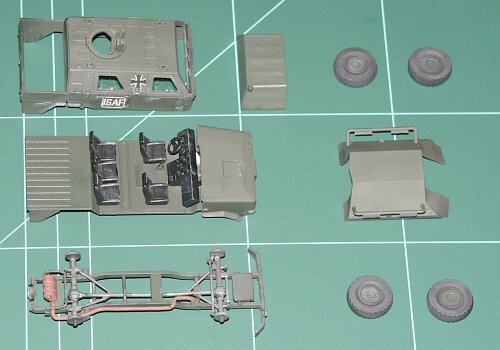 After dry fitting the subassemblies showed that everything would go together fine, all parts were airbrushed in the basic color (Humbrol 75, dark olive green). The cargo compartment canvas cover got a coat of the same color, slightly lightened with beige (Revell 314). 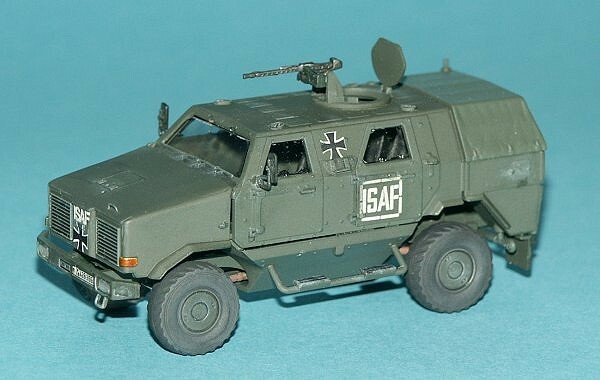 I decided not to build one of the vehicles proposed in the instruction sheet but an all green ISAF vehicle. The ‘iron cross’ style national insignia on the Revell decal sheet are somewhat out of register so I replaced them with decals from a TL-Decals (http://www.tl-decals.com ) generic German markings sheet. These turned out to be very fragile. It took several attempts for me until they went on without fracturing but at least there were enough crosses on the sheet. The Revell decals were much easier to handle and went on without problems. Next step was a light wash to bring out the radiator grille, door and roof details and a more heavy wash for the suspension and transmission details, Then everything got a final flat coat (Testors) followed by light drybrushing. The headlights, rear lights and turn indicators were painted silver. The interior of the kit was completed with dashboard, steering wheel, gear shift lever and seats. 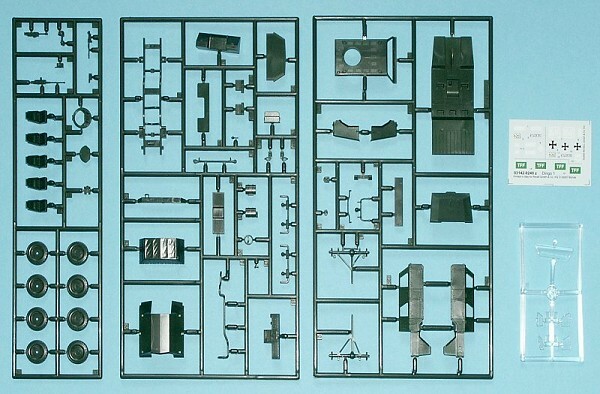 In difference to other modern Revell kits the windows are provided as injection molded parts which is acceptable considering the ballistic glass on the real vehicle. Fit is very good with the side windows literally clicking into place. Nevertheless it is a good idea to attach them with a drop of glue. In the final step the subassemblies are mated and the last external details (rear view mirrors, roof hatch, and antenna stub) are attached. As a last step the turn indicators and rear lights are painted with clear orange and red respectively. 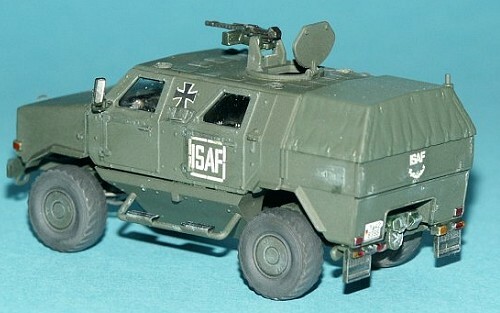 The Dingo fits nicely into the modern Bundeswehr vehicle series of Revell. Detailing is nice and fit very good only the decal sheet could be printed with more care. While the kit is not as spectacular as other small scale military kits (like the FAMO and Nashorn kits) Revell produced recently, it is still a very nice kit of an interesting subject. I recommend this kit to all modern armor modelers – this would be a great kit as a first small scale model as well.